Sometime late last summer I was thinking I could use a new jacket or two . . . and since I'd had some success with a couple of simple blouses and the jeans-style jacket, I thought I should be able to handle something like Butterick 4463. I like this style because it is simple and classic . . . and can't you just imagine machine embroidery on the yoke, or along the front facing . . . so there are possibilities for simple embellishments. 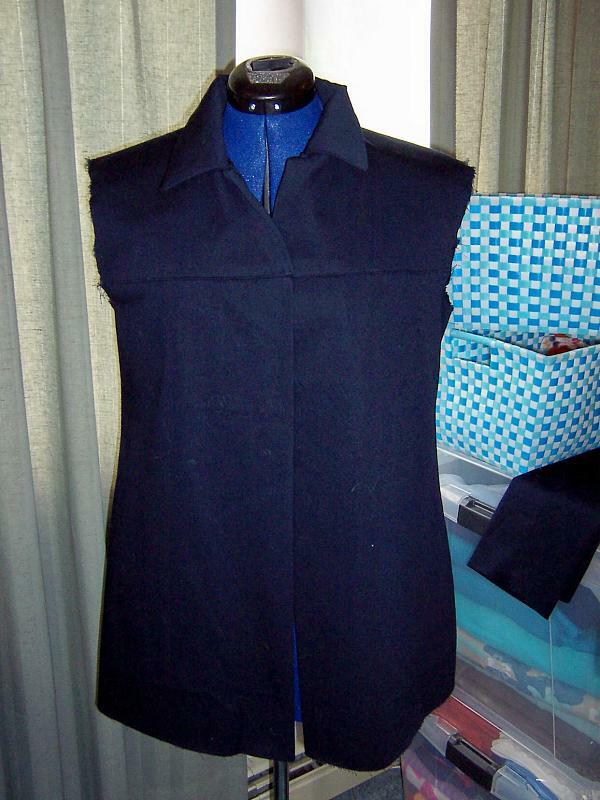 I wanted to use some "good" fabric for a muslin/practice version of the jacket to work out the fitting and assembly before getting fancy, so I chose some navy blue twill from JoAnn Fabrics. This was probably from the Red Tag fabric section, purchased with Creative Cash on a day when the Red Tags were marked down 50% (or I must have had a coupon). I don't remember exactly . . . I do remember thinking the price was right for an experiment. The twill has a tiny bit of stretch to it, so it must have something besides cotton as a content. I pre-washed and dried it before cutting into it. It's a good thing this is for a practice garment, because it is a lint magnet! I have been constantly removing stray bits of thread, lint and Westie hairs during the construction. I usually check this before buying fabric -- if there's lint in the store, there will be Westie hair stuck to it at home. That's why I think it must have been inexpensive enough for me to put up with lint. Anyway, I've been thinking about this jacket for a few weeks and finally got started on it in late April. The pattern calls for fusible interfacing for the collar, under collar, front and back yokes and front self-facing. In my stash of interfacing I only had white fusible interfacing and because this navy fabric is so dark, I wanted to use black interfacing. After a quick trip to JoAnn's in Ramsey (where the interfacing just happened to be on sale at 50% off) I had a woven black interfacing ready to fuse. I usually use a non-woven interfacing; but this was the only black I could find other than a knitted fusible, so it will have to do. I really should have read up on the proper use all the different types of interfacing -- but I'm just too impatient and wanted to get sewing! I didn't have any real problems fusing the woven interfacing to the twill; I just followed the directions that come with the product. It actually says that it is intended to be used for cuffs and collars, so I guess it must be okay to use for this project. When I began preparing the pattern pieces before cutting my fabric I realized I'd bought the smaller sizes again -- sizes 8-14. Well -- I'm usually a 14 at the shoulder/bust, and a 16/18/20 for the waist through the hips. So I was worried this would be too small again, just like the blouse pattern. I spent a lot of time measuring the pattern, calculating ease and decided I'd be okay if I gradually added about 2 inches starting at the waist down around the hip/pocket area and through the lower edge. I'm making the shorter version, View A, for this practice jacket. So far, the construction has gone together fairly well. I have been taking my time, sewing only about 2 hours each day -- mainly because these Westies keep interrupting me with requests to go to the bark park and stuff like that. 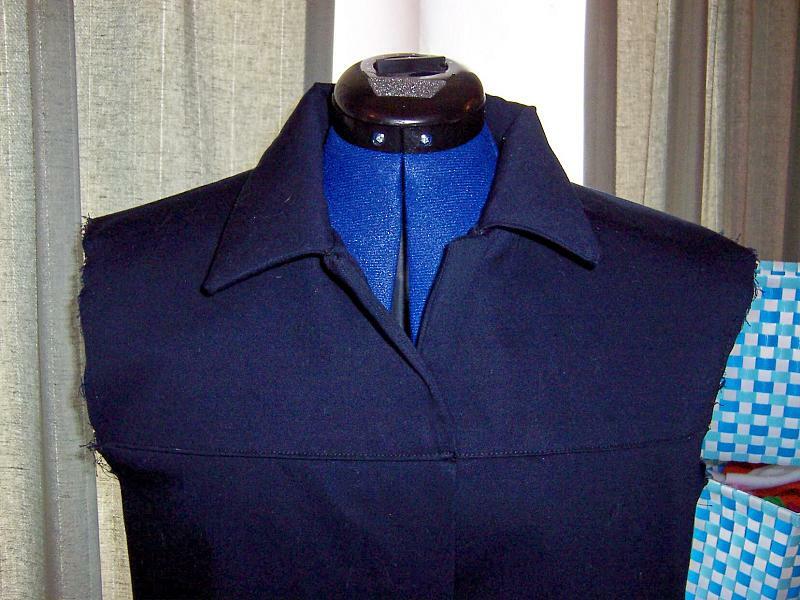 The jacket starts with assembling the yoke fronts and back and the undercollar as a unit. Then the yoke front and back facings and collar are put together. The two units are joined together by sewing the collar and under collar and the fronts together. I was able to finish this in one day and I think they turned out well. Next, the jacket front and back are attached to the yoke and then there is some topstitching and slipstitching the facings. That was another day's work. Then the pockets are added and the side seams are stitched. I decided to use a narrower seam allowance of 3/8" on the side seams to give me a little more room, just in case I hadn't added enough to the pattern adjustment. The sleeves are assembled and ready to be added to the main garment. I like that the hem is turned and finished before attaching the sleeves to the jacket. I serged the raw edge of the sleeve and then used a blind hem foot and stitch on my sewing machine to finish the sleeve hem, and I am pleased with the result. I did attempt to attach one sleeve already, but I didn't like the way the shoulder seam looked -- there were little puckers and pleats where I'd tried easing the sleeve to the armhole. So I ripped it out and will try again; I think maybe I didn't distribute the ease over enough of the shoulder section, so it ended up poofing up at the top of the shoulder. I want a nice smooth shoulder seam -- no poofs! This may eventually require an adjustment to the pattern itself for the next version of the jacket. We'll see. I definitely need to work on this section during the daytime with extra light so I can see what I'm doing. Even with two Ott lights and all the extra lighting in my sewing area, I had some trouble seeing this while working at night. The good news is that for the most part, the jacket fits nicely so far. It is a little snug with multiple layers under it, but I think it will be better worn for late spring/early fall when all I would need is a light jacket. Otherwise I'll have to go and buy the larger pattern. The collar looks a little wonky in the these photos -- that's just because I folded it poorly to take the picture. It looks nicer on me. I've lightened the photo a bit so that some of the details can be seen on the this very very dark navy. I'm actually using black thread because all the blues were too bright. There is supposed to be more topstitching on the collar and along the front finished edges, but that step is in the instructions after the sleeves are attached. I'll worry about topstitching after I figure out the sleeve issue. This jacket calls for 1/2" covered shoulder pads and five 3/4" buttons. I'll probably use blackish buttons from my stash (even if they don't quite all match each other) and will wait until after I've attached the sleeves before I make any decisions about the shoulder pads. I have some . . . just don't like 'em. But if they are needed, I'll go ahead and put them in. Once this practice jacket is finished, I have a really nice slate blue fabric for the "good" version. I think it is a lightweight twill . . . I really should start labeling these fabrics right after I buy them, because trying to find the original receipt now is a lost cause.